8" wide x 4.75" high (20.5 x 12) cm, after felting; 11” x 5.5” (28 x 14) cm, before felting. Felting can be like magic. One minute you are just washing a project and the next you have a completely new fabric. 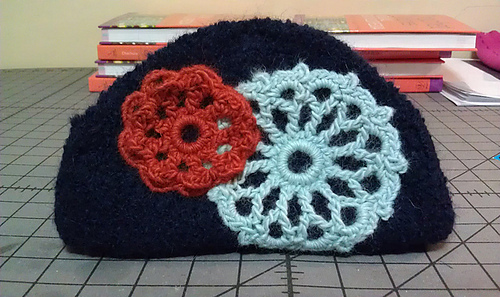 This clutch uses that magical felting to make a sturdy clutch, and a great base to decorate. 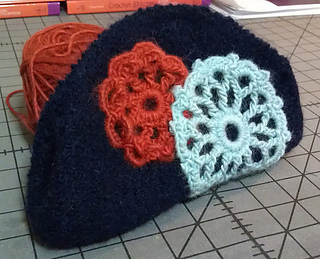 Make clutch and needle felt on any motif for a quick fun project. Shown: Blue Sky Alpaca, Suri Merino (60% Baby Suri Alpaca, 40% Merino Wool; 164 yd 150 m/3.5 oz 100 g): #423 twilight (MC), 1 hank; #417 seamist (A), 25 yds 23m; #420 autumn (B), 25yds 23m. Hook: H/8 (5 mm) or hook needed to obtain gauge. Notions: Tapestry needle for weaving in ends, needle felting pad and pen, magnetic purse closure. 16 hdc by 11 rows = 4” x 4” (10 x 10 cm) in stitch pattern. 8” wide x 4.75” high (20.5 x 12) cm, after felting; 11” x 5.5” (28 x 14) cm, before felting. 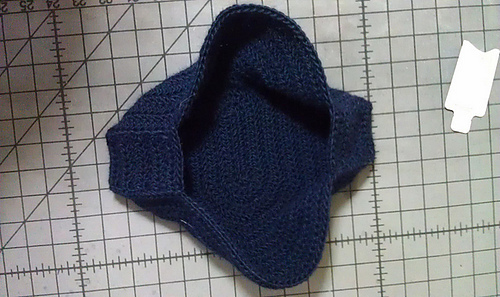 Clutch is crocheted and seamed before felting. 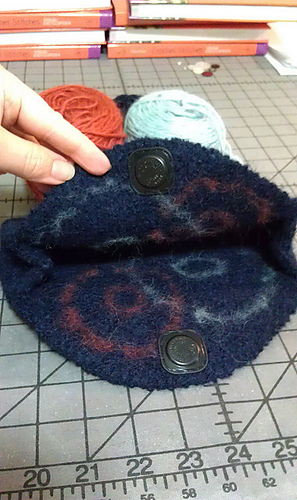 Motifs are needle felted onto clutch after.